I graduated from the University of Tennessee College of Architecture with my Bachelor of Architecture in Spring of 2016 and have been working towards my licensure as an architect in Nashville at Gresham, Smith & Partners. Art, architecture, and design as parts of a single pursuit. The more we can blur the borders between these concepts, the better. The more we try to separate and define them as separate entities, the less progress we make with any of them. I believe that our existence can be enhanced by the way we design the things we interact with on a daily basis. I look at how buildings, vehicles, and products succeed and fail in their approach toward improving the human condition and strive to address these successes and failures in my own work. Buildings are temporal vehicles. Space becomes separated from space and a new environment is created within, allowing changes in time, temperature and atmosphere to occur separately within and without the line of enclosure. The rivers of the South are ruptures in time. The endless flow of water and the stillness of reflective stars collide and combine in ancient veins dug down into the Earth. The river has been augmented by bridges, dams, and vessels that collect, control, or mitigate the natural state of place to better suit those who encounter it. 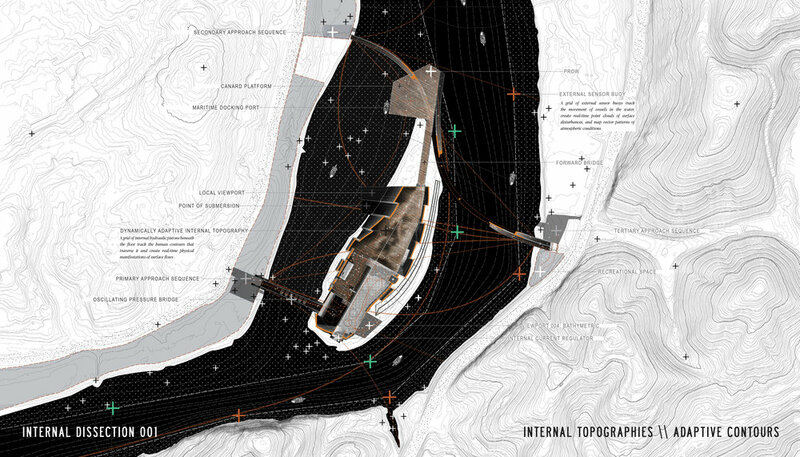 What other prosthetic forms can help us encounter the river in a new way? Time is collapsed by high speed machines. The spy plane and the bass boat compress the vector of time into short bursts of acceleration. Lockheed Martin's SR-71 "Blackbird" adjusts its surfaces and perforates its skin in order to survive at the extremities of the outer stratosphere. It remains hidden from detection through geometry and speed. The high speed bass boat of the South avoids its prey though speed and surface reflectivity. Depth and pressure press on bathymetric contours define form. Skins separate and interlock to reveal bone and tendon beneath, breathing in and breathing out through ducted gills of sheet steel. Active floor panels track movement and physically react, creating internal topographies. Internal dialogues of form and texture create an experience of speed and of progress.